A giant radioactive meteor has crashed into the County Prison, freeing six criminals and giving them super powers! Travel to Super Power to become a superhero (I know...) and stop this madness! To do this you'll have to face someone who can copy themselves infinite times, a madman that can run much faster than light, and flying Betty, who doesn't look so harmless until you see her glowing orbs hurtling towards you. Let's pound some villains! Okay, but first you'll have to become a super hero. 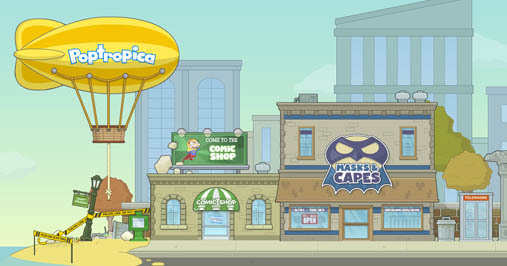 That's not too hard... just run right into the Masks and Capes store and talk to the guy there. Put on a costume if you like after you've gotten the ID card. Swim left to the prison. Snag the Superhero's Handbook from the guy, Ned Noodlehead, inside the Comic Shop on the way. You can have some fun with the bell on the desk (I really enjoy irritating him. Okay, okay, so maybe I DO annoy everyone else too!!!) The cops will let you into the area now. Talk to them and soon you'll have the criminal profiles and the "Anti-Power" handcuffs. You'll also find Hazmat from the Creator's Blog on top of the meteor. 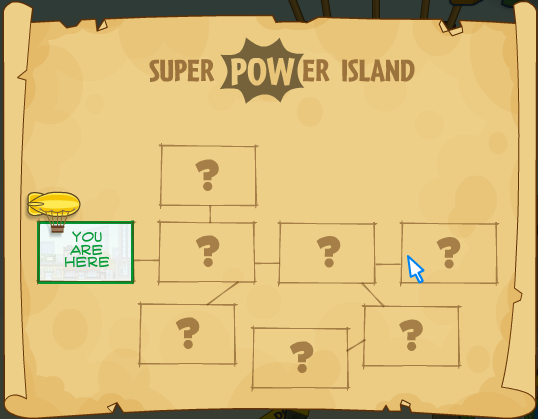 Now that you have all the necessary tools and are familiar of the story of the island, you can start pounding supervillains like you always wanted to. You can also talk to the retired superhero on top of the Daily Paper building, but he'll only help you if you've beaten at least five of the villains. That's fine; go right and into the Bank for now. Copy Cat [easy] has broken into the bank vault. Walk near her and she will drop a smoke bomb, and copy herself multiple times! You have to beat all the copies to beat her. There are five upstairs, five downstairs. The first one is on top of the light, above the door to the bank vault. You'll have to jump onto the small ledge first. Drop off, and make your way right, tagging copies as you go. Call the elevator, and then get onto the ledge above you. Hop off, get the one on the light, the elevator should be ready by now. Go up, hop off, and knock out the other five ones. The last one is the real Copy Cat... yes, you've got her! You can see her in jail now, and you'll also get another stamp on your card. Quick Tip to save time, you can hop out of the elevator before it reaches. Speeding Spike [medium] Run past the bank and down into the Subway (don't worry about catching Betty Jetty, you can't do this until you can fly.) You'll find the same cockroaches as in Reality TV here. You'll soon find Speeding Spike has hijacked the train. Enter the subway to start the real adventure... this part is similar to the sumo wrestling part in Red Dragon. Keep jumping over him when he comes toward you, but make sure you're to his left when he gets really mad (his face turns red) so that he will slide into the next car. Try not to get too twitchy! Eventually he will slip, and you will capture him with the Anti-Power handcuffs. Yes! Only four more to go. Sir Rebral [medium] Go right, past Downtown to the City Park. Pick up a hot dog on your way. Try to get close to him while he is moving rocks, so he will get mad and hit himself. Now he'll attack you with huge chunks of the ground. Go right, to the boulder near the restrooms and push it left. If you're lucky, a piece of the ground will pop up, sending the rock hurtling towards Sir Rebral. The best place is near the bench. He will get knocked out and you can handcuff him. Halfway there! Ratman [hard] Go into the restroom and down the sewer. Swim left and give the red water control wheel a spin. These control the water levels. The water will lower enough for you to find the next wheel, to the right. The water level will become just right. Swim left, activating the last wheel. Now go through the door to face Ratman. Avoid his rats long enough so you can climb all the way up to the wheel. Turn it, and he will be doused by the water. Evade his stinging flies so you can handcuff him. Four down, only two more to go!!! Crusher [medium] Run all the way right, to the Junkyard. Crusher will be (shocker) crushing everything in sight. Go left on the fence, and jump up onto the tires. Speaking of which, you'll also have to jump up at a regular interval to avoid his stomping outbursts. Once you've reached the car, hop onto the tower and make your way up and into the magnetic crane cab. Shut it off and the refrigerator will land on Crusher. He will become outraged, and chuck the fridge at you. Work your way up there again, but this time he's throwing oil barrels, making your path harder. The trick is to keep moving. This time turn the crane on, pulling up the plate he's standing on. Hooray! He will drop down, unconscious. Hey, didn't that retired superhero say something about beating five villains??? Pick up the phone while coming back from the prison to collect the flying power; totally awesome, but only available on Super Power. The old hero will quote Spiderman now ("with great power, comes great responsibility.") Now you're ready to face Betty Jetty, on top of the residential skyscraper in Downtown. Betty Jetty [medium] Climb the building and "GO UP." Fly after her and she will shoot out glowing orbs. Avoid them, and you will get closer and closer to her. You can only take five hits. Just fly off the screen when they come, but for the times when only one comes, you will have to kind of fly in circles around it because it comes at you twice. Soon you will knock her out of the sky. The files were right! She is an airhead. But she's coming back for a rematch! Don't worry; Ned Noodlehead will capture her for you. Handcuff her again and you will be back at the lockup. Don't you get the feeling you aren't getting the credit you deserve? Hey! And that warden gave the medallion to Ned! He barely did anything... hold on, before you blow your top, run into the Comic Store and you can bribe him with a hot dog. Sigh... You never know when they'll come in handy. BONUS: Check out the Super Hot Dog Boy comics on my Downloads page!